Those days sandwiches look so amazingly delicious and so yummy!!! I should try this sometime. Thanks for sharing this recipe. YUM! YUM! YUM! 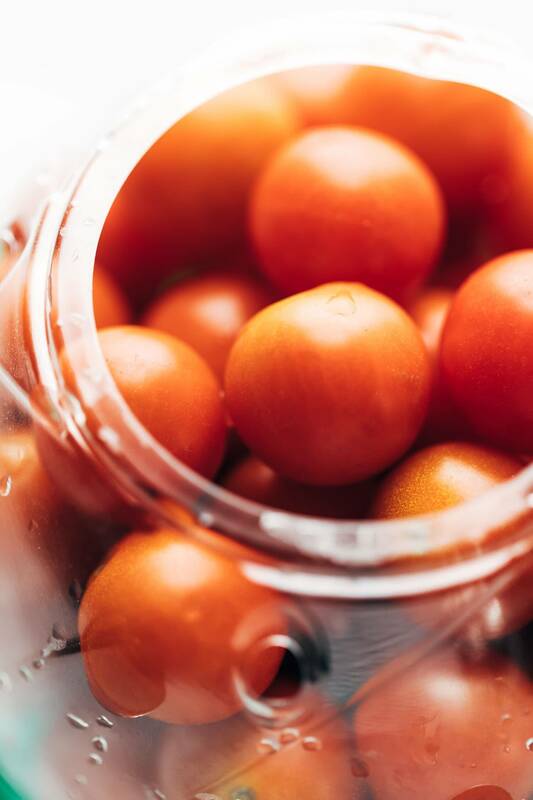 Love the idea of garlic butter tomato sauce with sweet little cherry tomatoes. Would be good as a roasted cherry tomato sauce too that just gets pulsed in the food processor. I usually don’t post until I’ve made the recipe, but, OMG, this sound awesome. I want to go make it RIGHT now, but it’s 11:30 pm and will just have to wait. Thanks for a great recipe! The summer produce is in full effect around here, I need to snip off some basil and tomatoes and make this sammich. These photos convinced me, lol. “When you pull that sandwich off the skillet, let me just tell you: you are in for THE BEST MOMENT OF YOUR LIFE.” LOL, girl, you know it. A grilled cheese sandwich with a great cup of coffee or an ice cold iced tea is my version of PERFECT. 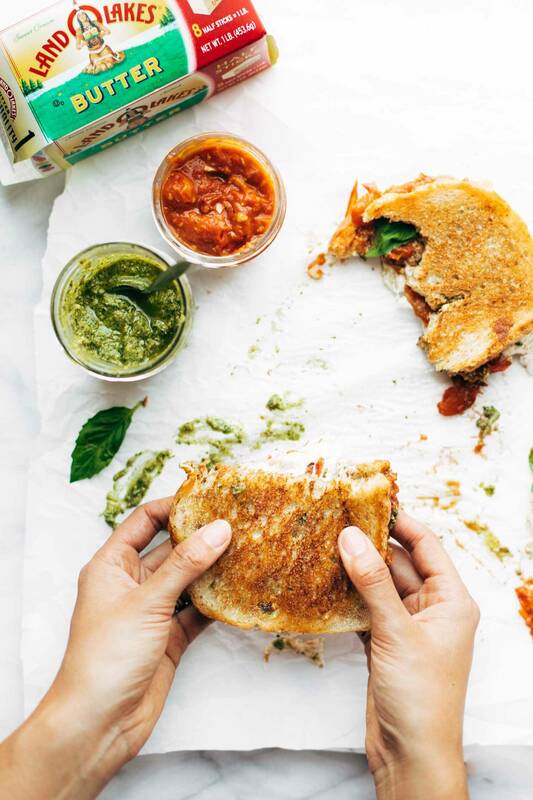 My wife loves Caprese Sandwiches, this will be the perfect weekend lunch for us! Thanks! Caprese is literally my favorite! Can’t wait to try this! Hi Lindsay! Question for you. 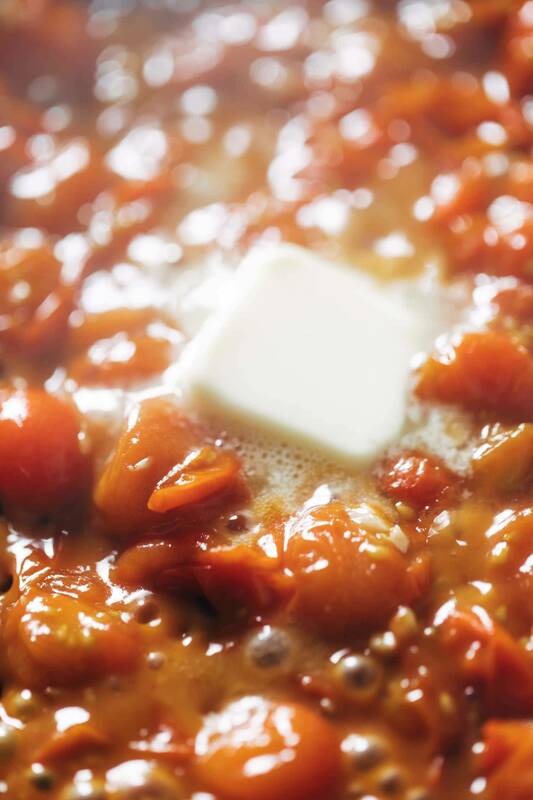 How long would you say the tomato-garlic sauce would keep on its’ own in the fridge? And do you think it would freeze well? Would love to keep some on-hand for other recipes! Looks very tasty, thinking about making this today. These look amazing! I never understood how amazing grilled cheese could be until we stopped at a food truck in Portland. (I got the one with jalapeno and some spicy cheese). We’ve been experimenting with some varieties, but haven’t got around to posting any yet (I have a ton of dinners, but am low on the lunch options). I’ll have to show my husband this. 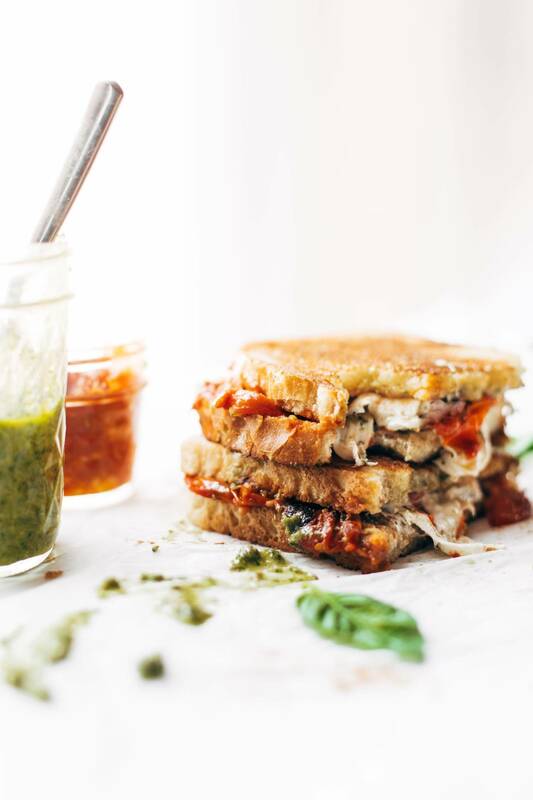 This is the perfect grilled cheese sandwich for summer! I love caprese flavors. I mean who doesn’t?! I wish Land O Lakes is available here in Canada! I love love their salted whipped butter! I always make sure to buy one whenever I go to the US. Awesome! Glad to hear it, Jill! I was poking around and wondering what to make for dinner and remembered this recipe! I had some leftover pesto, mushy grape tomatoes and regular ol’ wheat bread. Subbed in apple cider vinegar and sugar for the balsamic vinegar and I had a delicious dinner ready in thirty minutes! Loved it!! 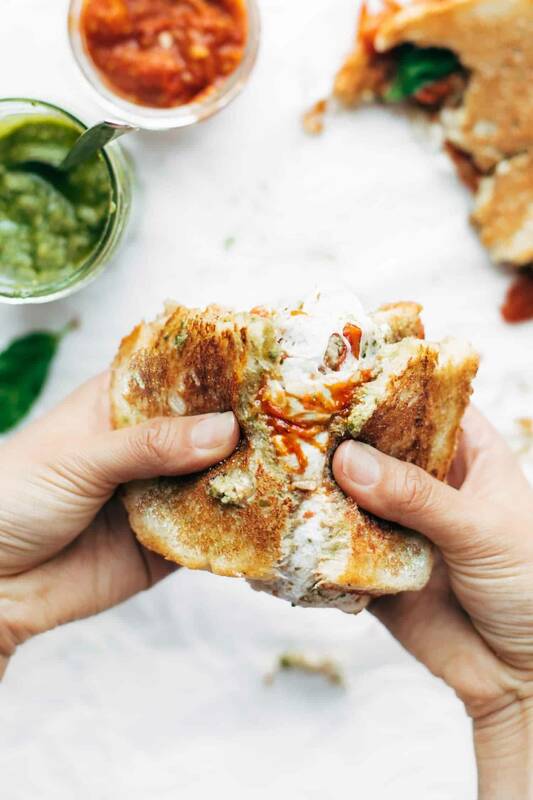 SO GOOD with the tangy tomatoes, pesto and cheese. I might add a chipotle chili to the tomato sauce for some heat next time, but otherwise perfect!! Just made it tonight and it was SO AWESOME…seriously can anything more delicious even exist?! I wanna go on a good food run must make NOW! Lindsay, this was so delicious! Even though my partner and I couldn’t muster up the courage to venture again into the VA heat for balsamic, the grilled cheese(s) turned out perfectly. I just burnt my tongue on the garlic butter tomato sauce and I don’t even care. SO GOOD. I made this with a baguette and it was perfect. Ha! Totally worth it, right? 🙂 Glad you enjoyed it!